There is strength in numbers. Every day, CAA is working on behalf of professionals in the visual arts to create resources, build networks, and encourage scholarship at the highest levels. The louder our voice, the more we can do. 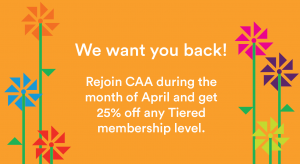 Rejoin CAA during the month of April and get 25% off any Tiered membership level. Plan on participating in the 2020 Annual Conference in Chicago, February 12-15, 2020? Submissions are due April 30, 2019. Join your colleagues and fellow professionals in creating the programming for the largest gathering of art historians, artists, designers, curators, arts administrators, museum professionals, and others in the visual arts. Now is the perfect time to rejoin and save. Offer valid from April 1–April 30, 2019, 11:59 PM EST, to individual lapsed members for a one-year membership. Discount applies only to those whose membership has lapsed between January 1, 2012 and January 1, 2018. Log in to your CAA account to view the discount code. Questions? Contact Member Services at 212-691-1051, ext. 1.